Brass slotted machine screw 10-32 thread 5/8" long. Hex socket head cap screw has 10-32 partial thread and length of 1-1/4 inches. Cap screw 10-32 x 7/8 inch socket head. 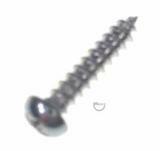 4 x 1/2 inch sheet metal screws Phillips flat head.